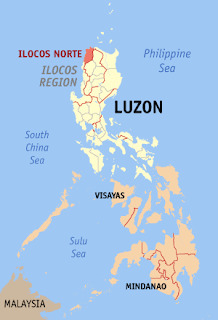 This is the second reason why I was very eager to visit Ilocos Norte. I wasn't just contented seeing it on postcards, on friends' photos, books and magazines - I have to see it in all its glory. The St. Augustine Church or popularly known as Paoay Church is one of the oldest churches in the Philippines. It's construction started in 1694 by the Agustinian Friars, completed 1894 and was re-dedicated in the same year. It is made of coral blocks and brick that incorporates Gothic, Baroque and Oriental designs that add up to its striking appeal. Built to withstand earthquakes common in our country, it is probably the best-known “earthquake baroque” church in the Philippines. In fact, one of its key features are the 24 carved buttresses that support the church’s structure during earthquakes. Unlike other bell towers in most churches around the country, the Paoay Church's stunning bell tower is detached from the church. This is to avoid the tower from smashing on the structure when an earthquake occurs. It is not just an architectural masterpiece but also has historical value. During the Philippine revolution in 1898, it was said to be used by the Katipuneros as an observation post, and also by Filipino guerillas during the Japanese occupation in World War II. 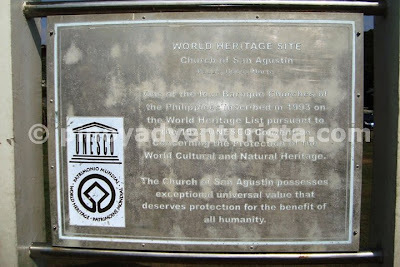 Having been to San Agustin church in Intramuros Manila and Sto. 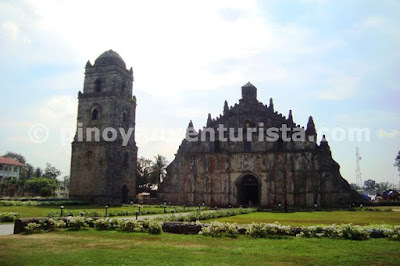 Tomas de Villanueva Church in Miag-ao, Iloilo last year, Paoay Church is the 3rd church that I was fortunate to visit that is proudly inscribed in the UNESCO World Heritage list of Baroque Churches in the Philippines. 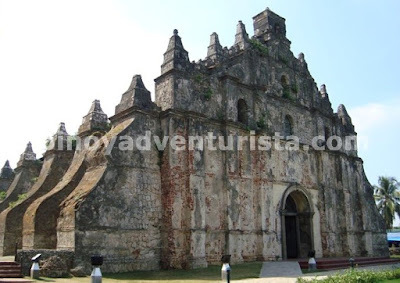 Leaving Nuestra Señora De La Asuncion in Santa Maria, Ilocos Sur left unvisited - which I plan to visit soon. 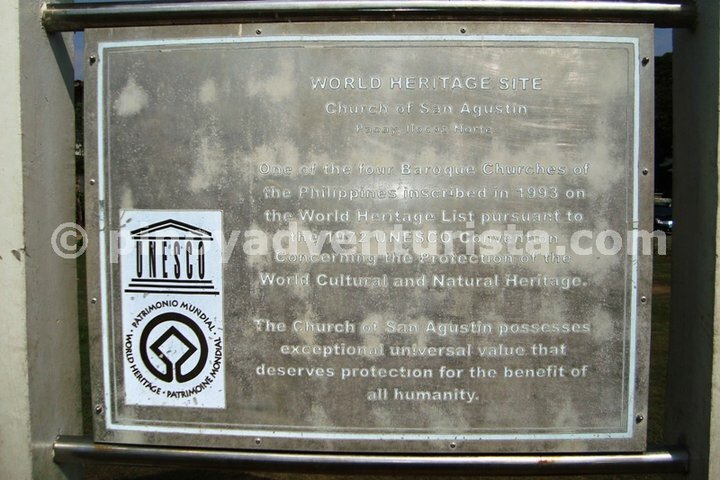 I could have visited already the four churches if I didn’t miss it on my trip to Ilocos Sur in 2005. 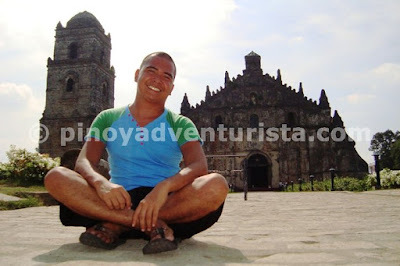 You shouldn’t miss this impressive example of baroque church in the Philippines. 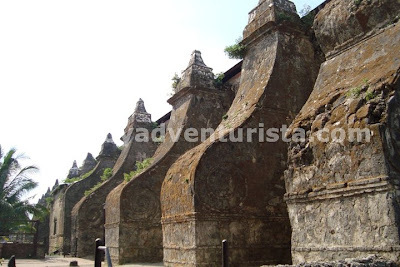 A must-see attraction when visiting Ilocos Norte. 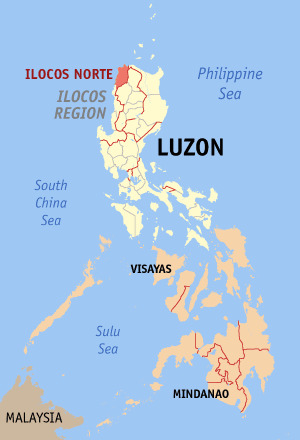 Knowing that it is located at 16 KM south of Laoag, I rented a tricycle in the city proper for 250 pesos, going to and from Paoay. Travel time is around 30 minutes. With my rented tricycle, I was able to visit the Church and Malacañang of the North, which are both located in the town of Paoay. Renting a tricycle for 250 pesos is good enough especially if you're 3 in a group (which is it's normal capacity). Posted on June 16, 2011 Categories: Churches , Ilocos Norte , Trip ko 'to.. I want to see this church in the evening! Great tip on renting a trike, I wouldn't have thought of that since may jeep option. lumang luma na ang church pero ang ganda ng pagkagawa. nice. nag backpacker din kame dito. nakakamiss. sa malapit sa simbahan na to mayroon nagtitinda ng pizza na kakaiba. pakbet ata saka dinuguan. masarap naman. ang miss ko sa ilokos ay food trip. hehe. sarap ng bagnet at empanada. wow ang ganda naman jan. never been there i hope makapunta ako this year. it's actually one of the unique oriental church in the country. i wonder if you already visited the one in tumauini. though not as grand as this but also unique. Very Nice church! The Agustinians really are into big and strong churches noh? I've been wanting to visit this church for so long, I'll make sure to put it on my Ilocos itinerary when I get the chance to visit the place. I am just curious on how was the system in constructing their foundation to withstand the earthquake with those huge and wide columns [layman's term of post]as supports which were made of corals, limestones and so on.:-). wow, one of the amazing churches perhaps... hopefully matuloy ako magbackpack or rather mag round pinas with my bike hehehe... bisitahin ko talaga to.